I wanted to write this blog entry while this race was still raw. I think raw is a good word as it feels like a fresh wound that is smarting. Firstly, I am absolutely gutted about what happened at this race. The basics are I was in the lead and, from what I hear, by a very good margin and also on course record pace, but at 38 miles into the 55 mile race, I had to pull out. Secondly, I want to make it clear that I have the utmost respect for those mentioned in the following paragraphs and sentences. I have not achieved what they have, but what you will read, is one of the reasons I am so gutted. I never tell anyone what my expectations are in a race. It may work for some, but I find that it doesn’t work for me. Sure, I speak to Mrs T, but only she knew what I was aiming for in this race today. Steven, my faithful support probably also had a good idea, but I didn’t come right out there and say it. I am the type of person who feels that if you put yourself out there too much, you create a bigger crevice to fall into. After the event, well, if it works out then superb, if not, nobody knew you had failed. Maybe this has been driven by the last 6 years of disappointment. I have really struggled in the last 6 years. I will blog about this another time, because there have been some drastic changes that have made a difference. Since the turn of the year things have really taken a u-turn. One of the benefits of the changes I have made in my life has been consistent quality training. I have watched week on week improvements in pace, endurance, strength and mobility. I feel like I was returning to the runner that I used to be 6 years ago, I was really enjoying training again and things were, and still are, looking promising. Now, I am going to say what my aims were and I will give the reasons for it, but I don’t want it to come across as disrespectful, which might be hard in written word and my lack of ability to express myself properly that way, so sorry if it does. I’ve ran 2 ultra marathons, the Glen Ogle 33, which I won in a new course record. The Glen Ogle is a small very friendly ultra that I have great memories of, but it was my first and I wanted my entrance into this world to be low key. That fitted the bill perfectly. Next up was the not so low key Devil ‘O the Highlands in 2014. I can honestly say I had 3 weeks of training for this race having missed about 2 months due to a hamstring tear. I came second to a very fast Casey Morgan, who went on to break the Jezz Bragg course record. 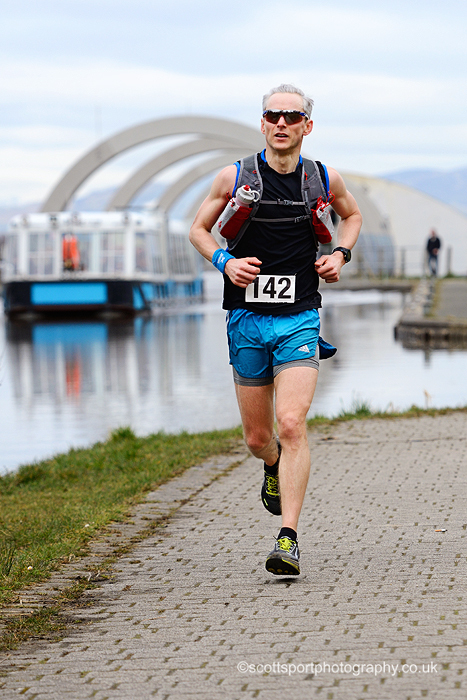 The Glasgow to Edinburgh marathon was to be my third ultra, and it suited me. It is flat and fast, just the way I like it. I really wanted to make my mark in the ultra world with this race. There I have said it. The way training has been going I knew I could break, or come very close to, the course record. I’ll re-iterate: I mean no disrespect to Marco Consani, the current course record holder. Marco is a fine runner with GB international and Scotland national vests to his name, but I honestly thought that I could worry this record. My long training runs of 4-5 hours have been quicker than the course record pace and I was confident, with the right taper and approach that I could run really well. Then there was Grant Jeans, again, another GB representative. Grant is quick, 4:25 for the Barry 40 recently shows form over this medium length distance and I knew I would need to be on my game to beat him. This race was my chance to move into those levels, I know I have the training behind me to do it. I have been getting some excellent coaching. My coach may not think that I was up there, by I knew. Maybe he was being cautious as I am still new to this sport. I was determined to show him too. I also don’t want to take anything away from Rob Soutar. Rob ran a fantastic race today to take the win in a great time, and I am really pleased for Rob. Steven picked me up from Livingston North train station and we make our way to Ruchil Park in Partick, Glasgow, where the race starts. We are way too early and wander around chatting to other runners and finding the first turn onto the canal. Before we know, it is just before 9am and we are asked to get behind the line for the race briefing. After a short talk we are off. Immediately Grant Jeans tears down the hill and onto the canal. By 5 miles he is well over a minute in front and I settle into a nice relaxed pace in second position. I go through 10 miles in about 66-67 minutes and feeling pretty comfortable. I can always see Grant up ahead when the canal straightens out. It was great to See Gillian Scott of (http://www.scottsportphotography.co.uk/) Scott Sport Photography taking snaps and then bumped in Kirky runner Stevie just after that, he ran with me for half a mile or so until he had to turn off. Good luck tomorrow Stevie, hope the niggle holds out. I go through the first checkpoint in about 1:25-1:26 and take on a new bottle of UCAN and a couple of gels. The pace is still the same, my legs feel excellent, my chest is a little tight, but I have been ill this week. I am not pushing the pace hard so I try to forget about it. It’s the remnants of a slight chest infection. I see Nikki up ahead and get a good shout from her, thank you!! Grant is getting closer to me though. I maintain my pace but he appears to be slowing slightly and by about 15 -16 miles I am only a few steps behind him. I decide to stay there, I mean, we are travelling at sub 6:40 pace and all I need to do is beat him. I have no desire to overtake and put in a burst at this point. However, there are a few road crossing to navigate and we both get to one where we have to stop to wait for traffic to pass. I see the clear road first and start running again, only this time Grant hesitates a little and I am in the lead. What do I do? I try to maintain the pace we were running at and look at my watch to see that is what I am doing, but I am starting to feel a little niggle deep in the hip. At this point it is just a small reminder that something isn’t quite right. I hope it stays that way and continue to press on. On the approach to Falkirk it is great to see Sandra and Ian (of West Highland Way Race fame) and I am feeling really good, they give me a little lift. By the time I reach the Falkirk Wheel, I’ve opened up a gap of a couple of minutes. Although I felt very fresh at the bottom of the Falkirk Wheel (after I miss the turn off for the wheel, doh!!! ), it was not the case when I reach the top of the climb to the Union Canal, only to be greeted once again by Gillian (http://www.scottsportphotography.co.uk/) where she took this snap of me. Apparently, just before I moaned about the climb!! The hip was getting a little more painful by this point but still bearable and I go through marathon distance in 2:53 and reach the half way point in about 3:01, feeling pretty good, but still that niggle persists. Good to see Tizer and Dexter Dog at Polmont and then STOOSH a little further on, cheers for the shouts chaps. I am getting a little worried by the hip now as I can feel a slight pull on the hip flexor area too. Was this being caused by me running in a way to protect the deep hip pain? Should I try to revert back? By the time I get to Linlithgow (and see my old project manager Joyce, which was great) I am in pain. I am still running well and the pace hasn’t dropped that much (just over 6:40 pace), but I am now experiencing pain on every single step. What do you do? I keep going to see if I can get any respite from it by altering foot strike, glute/hammy firing, even slowing down, but nothing is working. I reach Philipstoun in a lot of pain and my run now has a limp in it! I think to myself I can’t quit, I don’t feel tired, my legs feel good, I need to finish this race, I have so much running left in me, I am winning this race, FFS!!! But each right foot strike reminds me that my body is screaming for me to stop. Pain is a signal right? It’s a signal to stop doing what you are doing and at that point, in the middle of nowhere, I stopped my watch. 38 miles in 4:17:20, the last 2 miles essentially a walk/jog. I felt like crying. I stand there for about 5 minutes, I don’t know what to do. I call Mrs T and leave a message, who knows how I sounded on that message. Then I text Steven, tell him my race is over. All the things I had promised myself at the beginning and before this race I can see slowly being rubbed off the slate. This is how important to me this race was. This was my ‘A’ target for the first half of this year. I don’t have many decent years left in me, I have wasted 6 years with injury after injury, over trained state after over trained state. Here, now, I am in very good shape, I can feel it, I know it. I feel like crying again. I don’t have the words to express my disappointment. I put on my waterproof as I start to cool really quickly and I drink what is left in my water bottle and head on for the next check point. I stopped running at 13:17. Grant passes me at 13:37 and Rob passes me at 13:42, that is how big a lead I had gained. I can’t stop thinking about it, if only there was a way to start running again, I could catch them. How could I start running again? These are the silly thoughts that went through my head, then a slight stretch to jump a puddle and I am reminded of the pain, I’m reminded why I am walking. Then comes the consolidation. I have just ran 38 miles at 6:4x pace, given the circumstances, that is a good effort, that is a good training run. Could I have maintained that to the end? I suspect I would have been there or there about. Sitting here now, I feel like I have been out for a long Sunday run. If my hip was pain free, I would be running tomorrow. I didn’t leave myself out on that course. Maybe by the end that would have been the case, who knows now. Did I make the right choice? Yes, I have no doubts about that now. Mrs T gave a full dose of reality after the race and I live on to race another day. I’ll go and get some physio on the hip, look at more strength training and hopefully get to the route of the issue. As for the Glasgow to Edinburgh Ultra, I’ll just need to come back next year. Congratulations to everyone who finished the race today.